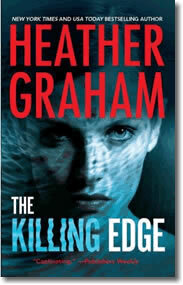 In stores and the first time in paperback is The Killing Edge, a paranormal suspense book from Heather Graham. Chloe Marin was lucky. She was just a teenager when a beachside party mansion turned into a bloodbath. According to authorities, the killers were later found dead in the swamp. Chloe’s not so sure. Ten years later, as psychologist consulting with the cops, she gets drawn in to the disappearance of a swimsuit model. Everyone assumes the girl ran off for some fun in the sun—everyone but Chloe, who’s been visited by the model’s ghost. Someone else is interested in the dead girl: Luke Cane, a P.I. investigating the disappearance for her father. Chloe and Luke barely trust one another, but they agree on the important things—they will bend the law to catch these killers, and there is an undeniable attraction between them. When another mass murder occurs, Chloe’s beginning to think her presence is no longer a coincidence. . .. There are also two favorite reader books which have been re-issued: THE PRESENCE and DEVIL’S MISTRESS. Lots to read and enjoy! Visit Heather’s website for more information about all these books.